The use of herbs to flavor food and for medicinal purposes dates back to prehistoric times. In fact, thousands of years ago, people traded herbs and spices as commodities. Fortunately for us, we don’t have to travel thousands of miles to find fresh herbs. Many are readily available at our local grocery store, or, if you’re like cooking celebrity Cathy Lentine, you grow your own, ensuring you’re using only the freshest herbs for your favorite dishes. “We grow parsley and basil and you can use these ingredients in almost anything,including chicken and pasta. I recommend using only fresh parsley and basil,” Lentine said, noting that these herbs can also be used to decorate dishes. Lentine has been cooking since she was young, watching and learning from her father, Domenic Bommarito. “I owe my cooking skills to him,” Lentine said. The Shelby Township Cooking with Cathy cable TV show lasted 11 years and Lentine’s dad was her biggest fan. “He was such a wonderful cook,” she said. Any cook worth his or her salt knows the multipurpose use of oregano in salad dressing, chicken, fish vegetables and bread. Baked potatoes are frequently sprinkled with chives and bay leaves are commonly found in soups and stews. Sage, rosemary and thyme, meanwhile, go hand-in-hand with turkey and pork roasts. And while many associate mint with veal, lamb and pork dishes, Lentine also uses it as a refreshing and healthy summertime beverage. “I make sure we always have a water pitcher with lemon water and fresh mint. It’s a natural detox,” Lentine said. Since our climate does not allow herbs to flourish year round, and not everyone has an indoor herb garden, Lentine came up with an interesting solution to ensure the herbs she uses are nearly as fresh in the wintertime. “I chop up several herbs – rosemary, sage, parsley and basil, for example – put them in an ice tray, cover them with olive oil and stick them in the freezer. Once frozen, I move them to a plastic bag and leave them in the freezer until I need them to season a dish. Be sure to use extra-virgin olive oil. It’s the best,” she said. Lentine shared two of her favorite dishes she makes using fresh herbs. 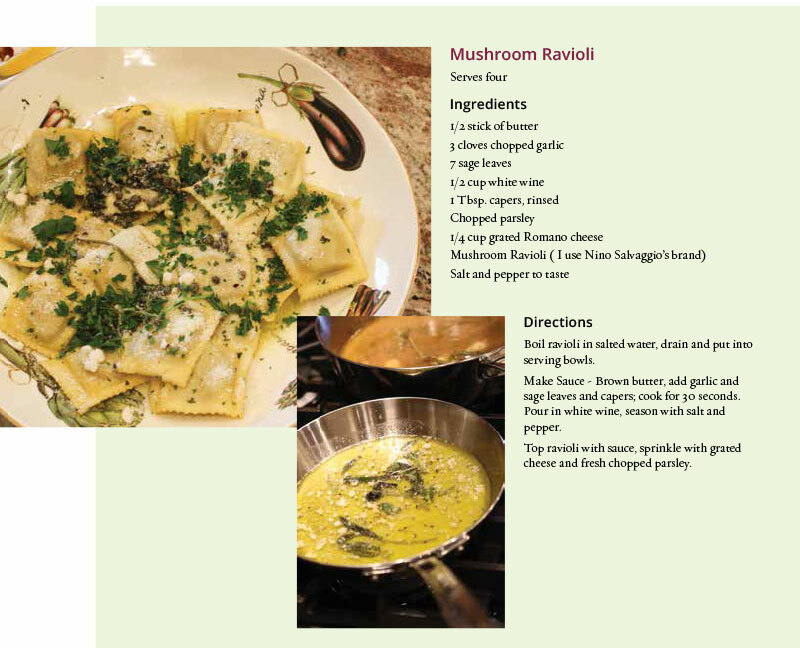 Her Mushroom Ravioli is topped with a buttery sauce of sage leaves and capers, white wine and salt and pepper. Then of course you sprinkle grated cheese and chopped fresh parsley on top to enhance the flavor and “of course it makes the plate look pretty,” she said. Her Chicken Picante recipe can also be used on fish or veal, just substitute the chicken breast for fish filets or veal cutlets. Garnishing with chopped parsley not only looks pretty but it adds flavor as well.